Most people would agree that love is the most wonderful thing in this world. Indeed, one of the greatest things that you’ll ever experience in life is to love and to receive love in return. When you love someone, it’s not enough that we show it through actions. We should also know how to express it in words especially during special occasions. So if a special someone is celebrating his or her birthday today, make sure to let him or her know that you remembered this special day. 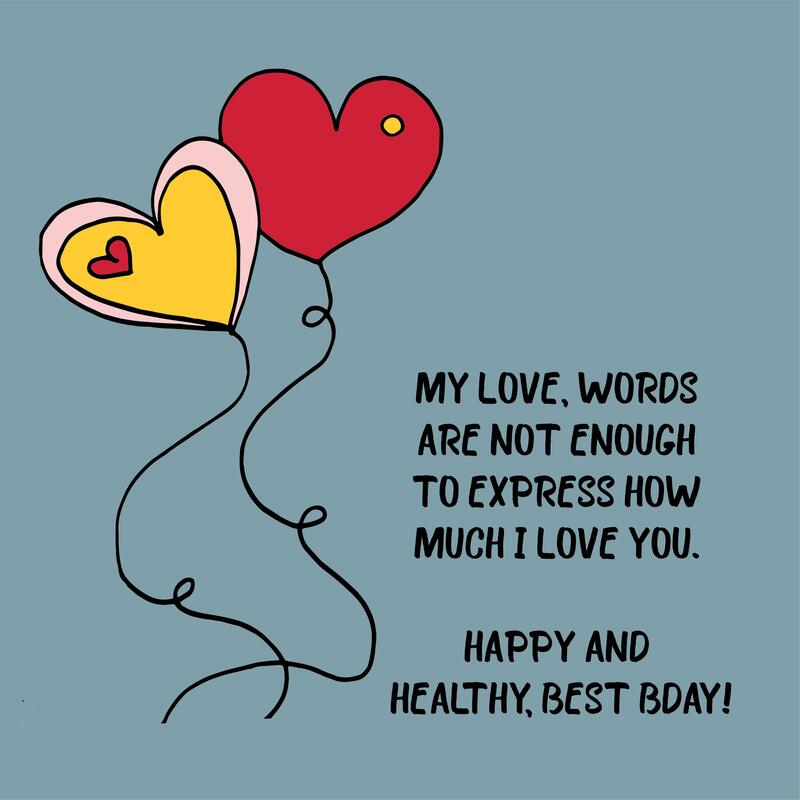 Here are the top happy birthday my love wishes and quotes to help you come up with a message to send to your special someone. Happy birthday my love. You’re the reason I smile and why our love has thrived even across the miles. May this day be the happiest day of your life! I love you so much! Happy birthday my love! I only want to grow old with you and no one else. You truly are the greatest gift I have received from God and I promise to take good care of you until the last days of our lives. Happy birthday to the special person who has brought so much joy and love to my heart. I cherish each and every moment I get to spend with you and I only want to wish you never ending happiness. Happiest birthday my love! Let’s celebrate this special day with a grand party. I hope that all the wonderful memories we shared will go on forever. Please know that I love you so much and there’s nowhere in this world I’d rather be than in your arms only. Happy birthday my love! There’s no birthday gift that will ever be enough to make up for all the blessings and gifts you have given me – unconditional love! Thank you so much for all that you have given me. My love, you are an angel from up above. Let us be happy this day because this is the day that God has sent me an angel on Earth. Happy birthday! On this special day of your life, I just wanted to remind you that I am truly in love with you. I am so lucky for having the perfect partner in life and I only wish that you’d have many more birthdays to come. Happy birthday, my love! My sweetheart, there’s nothing else that can bring me more happiness than seeing that lovely smile on your face! Please know that I will always be here for you no matter what. So enjoy your birthday and may you have a blast on your party! My love, there are no words that can express the love I have for you. It’s way bigger than the universe and much deeper than the deepest ocean on Earth! May you have a very happy birthday, my love! I love you so much! Happiest birthday to you my sweetheart! Staying in love with you is something that I want to do over and over again in my life. Thank you so much for the happiness that you have given me. My love, I just want to wish you a lovely happy birthday! Oh how I wish we could be together today. But even if I am far from you, please know that you’re in my heart every single day of our lives. I love you, happy birthday! My love, the day shines even brighter whenever we are together. I hope that on your birthday today, you’ll let me shine my love over you, so much so that it rivals the rays of the sun! Happy birthday! My dearest sweetheart, may you have a blast on your special day. I hope you will enjoy the small party I have prepared for you today. I love you so much, happy birthday! My love, the first time I saw you, I knew deep inside that you’re the one I have been waiting for in life. And each day that we’re together, I have fallen more deeply in love with you many times over. Happy birthday! My love, whenever we are together, it seems like my heart skips a beat and I can feel butterflies flying in my stomach! I guess that is how strong the love I have for you. Have a wonderful birthday, sweetheart! Happy birthday my love! On your special day, I hope that you’ll not only receive plenty of cakes and presents, but you’ll also get each and every once of love that you deserve. I love you so much! Happiest birthday to the love of my life! Please know that I’m absolutely in love with you. I hope that you’ll be able to achieve all the things you have been dreaming for and aspiring in life. I love you! There’s only one gift that comes close to what I’ve felt about you – the gift of my love. Happy birthday to you, my love! Please know that I will always be here for you, no matter what. I love you! 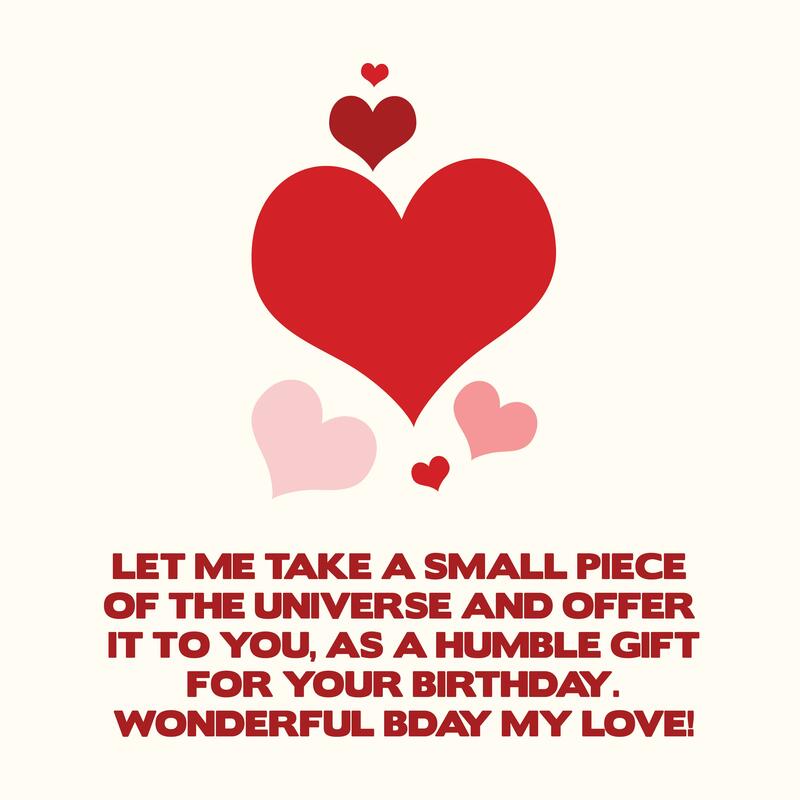 If only I could, I would certainly give you all the stars in the sky in a silver platter as my gift for you on your big day! But since I’m unable to do that, I’ll only give you my love, which you can keep forever until eternity. I love you dearly! It’s a bit too difficult to decide for a gift to give you on your special day. In fact, I was thinking of giving you the entire world, but I know that’s just not possible to do. But please know that my love for you is much bigger than the world. I love you baby, happy birthday! Happiest birthday to my ray of sunshine! You truly light up my life like a thousand suns! I love you so much my dear! I hope that your birthday party will be as perfect as you! To my one great love, have a happy birthday! On your special day, I promise to spoil you with all the things that you truly deserve. So tell me what you want, your wish is surely my command! I love you! My love, please know that my love for you will never ever fade. I promise to spend the rest of my life loving you and making you feel so satisfied and happy. Happy birthday! My dearest sweetheart, I’m truly blessed to have you in my life. You’re my one great love and fort that, I am truly thankful to God. Happy birthday! I love you to the moon and back! My love, everything in this world can be divided, but my love for you will definitely not end. May you have a very happy birthday sweetheart! You truly deserve all the happiness that the world can bring. My love, my heart is expanding in each and every single moment that I am with you. Thank you for making me feel how it is to be loved and for allowing me to love you back in return. I can never imagine my life without you in it. Happy birthday! Have a happy birthday to you my love! Since it’s your special day today, I want to take this opportunity to tell you how blessed I am to have you in my life. Thank you for all that you do. I promise to love you with all my heart until the day I die. My love, having you in my life is more than a dream come true. I find it a miracle that I have found my way in you. Thank you for making me so happy in every moment that I am with you. Happy birthday! My love, let’s celebrate your special day with so much love and happiness. I will make sure that this is the day that you’ll never ever forget. So enjoy your party, and most especially your special presents! Happy birthday! Happiest birthday to you, my love! I’d like to take this opportunity to let you know how much you really mean to me. In fact, you are my world, my life, my all, and the reason for my existence. Happy birthday my love. Thank you for providing me with everything even those things that I don’t deserve. I’m so lucky to have such an amazing, kind, and generous boyfriend like you. Enjoy your day! My dearest, thank you so much for teaching me the real meaning of love. We may not be together now but please know that I always think of you every single day. I know someday we will be together forever. I love you so much, happy birthday! My love, birthdays may come and go, but the people who remember your birthday will make sure to keep you within their hearts forever. Happy birthday my dear! Birthdays are a reminder that we have somehow won in our battles in life. Thank you my love for being my strength and my inspiration to move forward despite of all the challenges that we have faced. Happy birthday! Happy birthday my love! Thank you for being my partner in everything. May your special day and the coming years be filled with so many happy moments, abundance of blessings, and all the success that you truly deserve! My dearest sweetheart, on your birthday, I would like to take the opportunity to thank the people who brought you into this world, your wonderful parents! Without them, I would not be this happy. Happy birthday! Happy birthday my love. Here’s a simple message to remind you of just how much I love you. My only wish is for you to stay happy and that may you have the courage and determination to pursue your dreams in life! Happy birthday, my darling. Thank you for everything. You are the only one who has made me feel whole and peaceful. So now that it’s your special day, my only wish is for you to get all the things that your heart sets on. I love you! Smile is often the beginning of a new friendship while touch is the start of a new love. You’re the person who has given me both – friendship and love. Thank you for that, my love! Happy birthday! Although my calendar reminded me that your birthday is today, I want you to know that every day spent with you is special to me. I love you so much my love that I cannot find the right words to express how much I really love you. Happy birthday! I am sending you this birthday blessing filled with joy and love! I only wish sweet things to happen on your special day. I love you so much, happy birthday! It’s truly unfortunate that we’re not together now to celebrate your big day, but please know that you are always in my heart. Someday soon, things are going to change and we’ll be together forever and nothing can ever change that. I love you, happy birthday! I may not always show it too often, but I truly love you more than you’ll ever know. Thank you for coming to my life, my love! I promise to love, honor, and respect you for the rest of my life. Happy birthday! My dearest sweetheart, you’re my partner, my soul mate, and my best friend. I just cannot imagine what my life is without you in it. 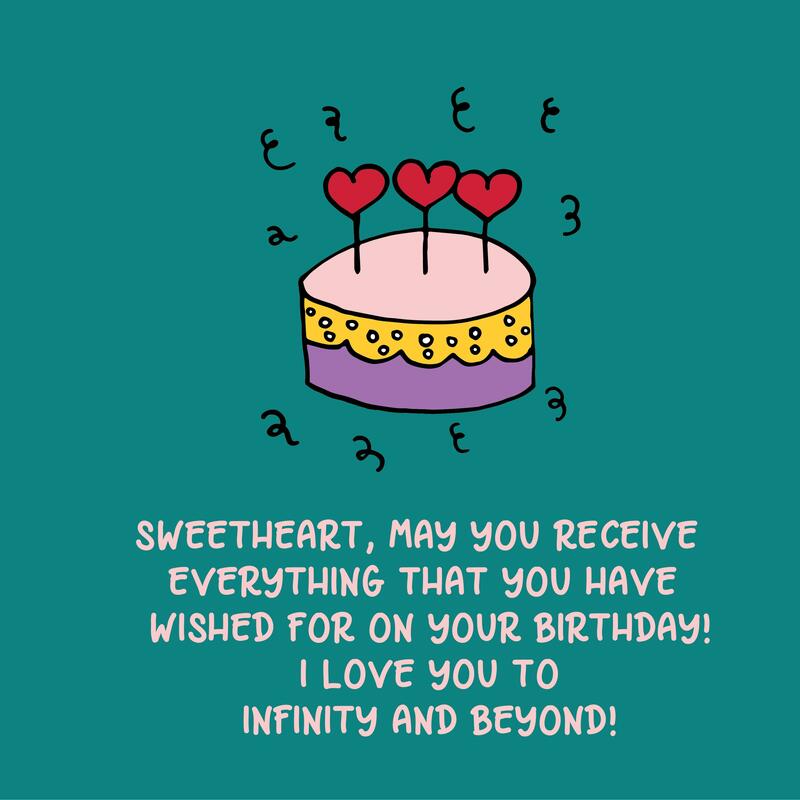 So on your birthday today, I want to let you know that you are very special to me. Happy birthday! I love you so much my love, although I truly believe that poets are the only ones who can express my feelings best. I’m not really creative and I know you knew that. Nevertheless, I want to greet you a very happy birthday! I love you. This day is truly special because this is the day that the love of my life was born on earth. Happy birthday to you, my sweetheart! Every day that I get to spend with you is like heaven on earth. I love you! Happy birthday my love! One day, when we recall this moment, we will realize that it’s only the first of the many more birthdays to come into our lives. But I want to celebrate your every birthday with you even until you reach 100 years old! Happiest birthday to the love of my life. Here’s a thousand kisses for you only. May you have a lovely day today and may you realize how much you really mean to me. Happiest birthday to the person who I love so much! 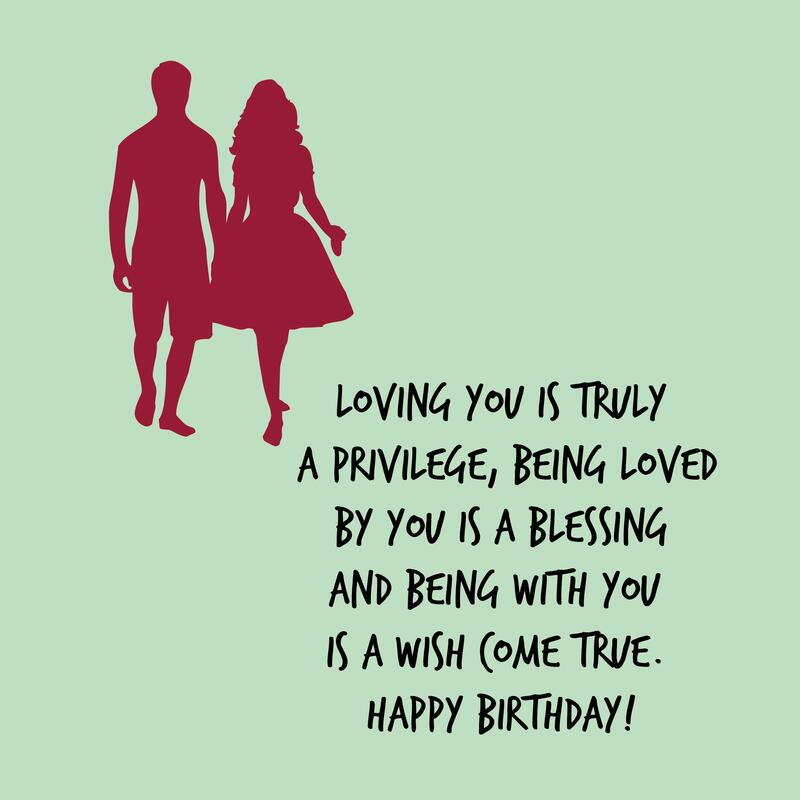 I may not be there to stand beside you as you blow the candles on your cake, but please know that you’ll be in my thoughts not just today, but every single day of my life! Happiest birthday to the love of my life. I cannot think of any other gift to give you today but my undying love and affection. I promise to continue loving you until the day I die. I love you so much my love! Wonderful birthday to you, my love! Simply thinking about you brings a smile to my face. Such smile gets even brighter and brighter each time I’m with you. I love you! It’s finally your birthday today my love! I would like to take this opportunity to let you know how much I truly love you. I cherish each and every moment I spent with you. I love you! My love, thank you for showing me the true meaning of love. Above all, thank you for all the things you have done to me. Happy birthday! Happy birthday my love! May each and every soul you touch bring peace and comfort in your life! On your special day today, my only wish is for you to achieve all the things you have long desired in life. I love you! Happiest birthday to the person who completes my life, the person who has made my life meaningful. Thank you for all that you do for me, my love! I love you so much! My love, I love you and I know you are truly aware of that. Now that it’s your birthday, I want to let you know how much you really mean to me. In fact, I can no longer imagine my life without you in it. My love, I know your birthday this year will be filled with surprises but I want that the first surprise will come from me. Happy birthday! I hope you will love the gift I have prepared for you. Happy birthday to the love of my life! I may not be there to celebrate with you now but please know that my thoughts and wishes are always with you on this very special day. My love, even if we’re physically apart, you’re always in my thoughts and in my heart. I promise you that nothing can ever come between us. On your birthday today, I want to let you know that I love you very much, happy birthday! I love you so much, my love! With you, my life has become so much colorful and fun and there was never a day that you bore me. Happy birthday! Thank you for always making me happy. My love, happy birthday! I hope that this year, you’ll get all the things you ever wish for. You truly are the kindest and most amazing person I know. I love you! My love, to spend my life with you is all I ever desire in life. I hope that your birthday will be as wonderful as you and will be as amazing as the kind of person that you are! Happy birthday! Happy birthday, my love! Now that it is your birthday, feel free to live like a king! So tell me whatever it is that you want, for your wish is definitely my command. I love you so much! My love, birthdays might come so fast, but my love for you will forever remain in my heart. Thank you for making my life even more meaningful. I never thought I’d be this happy until I meet you. I love you! It’s love that makes a house to become a home. So on your birthday, I would like to take this opportunity to thank you my love, for transforming our house into a home that’s full of love and wonderful memories. I’m sending you this special card and would like to give it to you with all my heart. Thank you for all the wonderful things that you did in my life, Happy birthday to you my darling! Finally, it’s your birthday my love! So kick your shoes off. Take a break and let me crank the tunes. Let’s dance, shake, and light the candles in your cake. Happy birthday! Happy birthday my love! Let God decorate each golden rays of sun and may it reach you with wishes of love, happiness, success, and prosperity! Enjoy your day! Happy birthday to you, my love! I only want to wish you one thing – a chance to see yourself as I see you since only then you will realize just how special you are to me. Happy birthday my love! May each and every gift you receive you on your birthday double and multiply your happiness on this special day! My love, you have brought so much happiness and wonder to my face. Above all, you bring so much joy to my heart. Thank you for everything that you did to my love. On your birthday today, I just want you to know that you’re the sunshine of my life. Happy birthday! Everything in this world can be divided but our love will never be separated. Happy birthday to you, my love. I promise to love you with all my heart even until the day I die! Happiest birthday to you my sweetie! My hear keeps on expanding in every single day that I am with you. 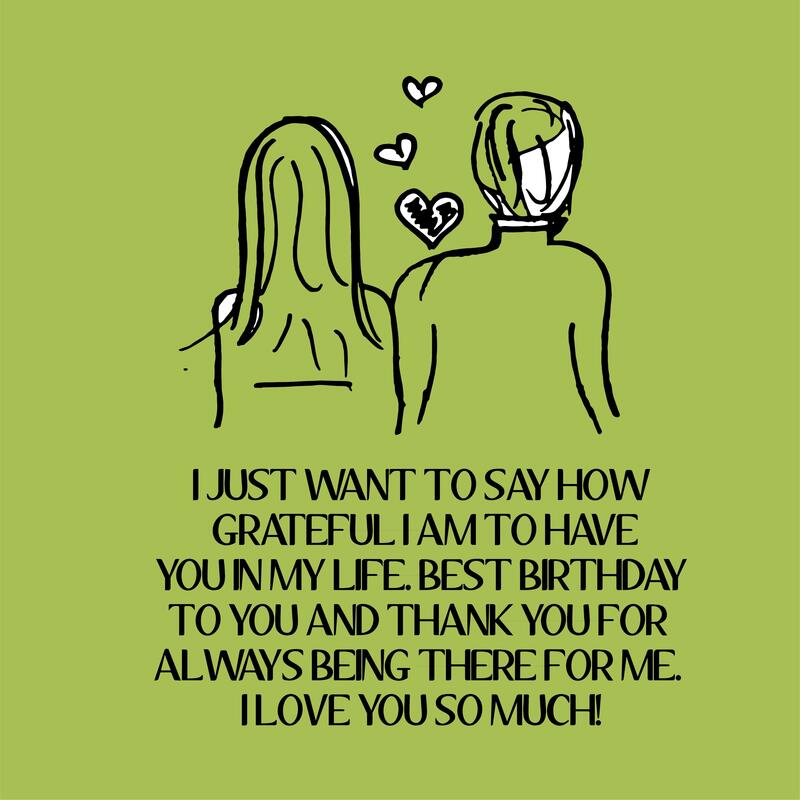 It’s your special day today so I’m sending this message to let you know just how lucky I am to have you. My love, having you in my life is definitely more than a dream come true. It is like a miracle and something that I never wished to happen in my life. Happy birthday to you! Let us celebrate your birthday my love. I also would like to take this opportunity to let you know how much you really mean to me. I love you to the moon and back, Happy birthday! My love, I want you to know how lucky I am that I have you in my life. Happy birthday to you! I only wish you all the best things in life. I love you! Happy birthday to you, my love! Thank you for teaching me the real meaning of love. We may be apart today but I promise we will have a one grand party once we are together to celebrate your birthday. Happy birthday my love! My gift for you is a gift of love and I promise to keep on giving you this kind of gift for the rest of our lives. I love you so much! My love, thinking about you is enough to light up my face and that smile gets brighter and brighter whenever I’m beside you. May you have a wonderful birthday my honey! My dearest sweetheart, just a glimpse of you is enough to bring a huge smile to by face. Thank you for coming into my life. Now that it’s your special day, I promise to give you all that I have in me. Happy birthday! My love, it’s your birthday! So make as many wishes as you can and don’t forget to blow all those candles in your cake. As for me, my wishes have already been granted on that day you came to my life. Happy birthday, I love you! Happy birthday my love! Thank you so much for showing me the real meaning of love. Thank you for all the amazing things you did to my life. I love you so much, happy birthday! Happiest birthday to my love, my partner in everything in life! All my life, I’ve been waiting for someone like you to come into my life and I’m so glad that you finally did. All the papers in this world are not enough to write down our journey. However, it can be edited to contain just one single word – LOVE. I love you so much, happy birthday! Time may pass and more birthdays may arrive. But remember that each and every single day that I spent with you will be special. I love you dear, happy birthday! My sweetheart, thank you for being the light in my darkness and my spark of hope during the most challenging times in my life. Happy birthday to you, my dearest! Happy birthday my love! Thank you for you never fails to show me your love. May God continue to bless you with all the things that you ever wish for in life! I love you so much. My love, I know sins can be forgiven but I cannot forgive myself if I will not take this opportunity to let you know how much I truly love you. So enjoy your special day and I hope you love the cakes and presents I sent over to your party. Happiest birthday to the most amazing husband in the universe! I still can recall that time when I was walking in the aisle. Those steps I take are a journey towards forever with you. I love you! Happy birthday my love! Thank you for giving me butterflies in my stomach everyday. So here’s wishing you a wondrous and joyous happy birthday! Whenever I look into your eyes, I only see our bright future that’s full of laughter and love. With you as my partner in life, I know I will live each day with unending hope and joy. Happy birthday! Happy birthday my love! Cheers to you, my best friend, my lover, and my partner! Every day, you have shown me how blessed I am and I am truly thankful that you came into my life. I love you! Happy birthday my love! Your presence in my life adds so much beauty to my life. You may be adding another year to your life today, but for me, you are looking younger and younger each year. My love, now that it is your special day, I would like to take this opportunity to thank you for brining me along in this journey. Life may not be easy but because you are beside me, I was able to pull through. Thank you and happy birthday! Happy birthday, my love! 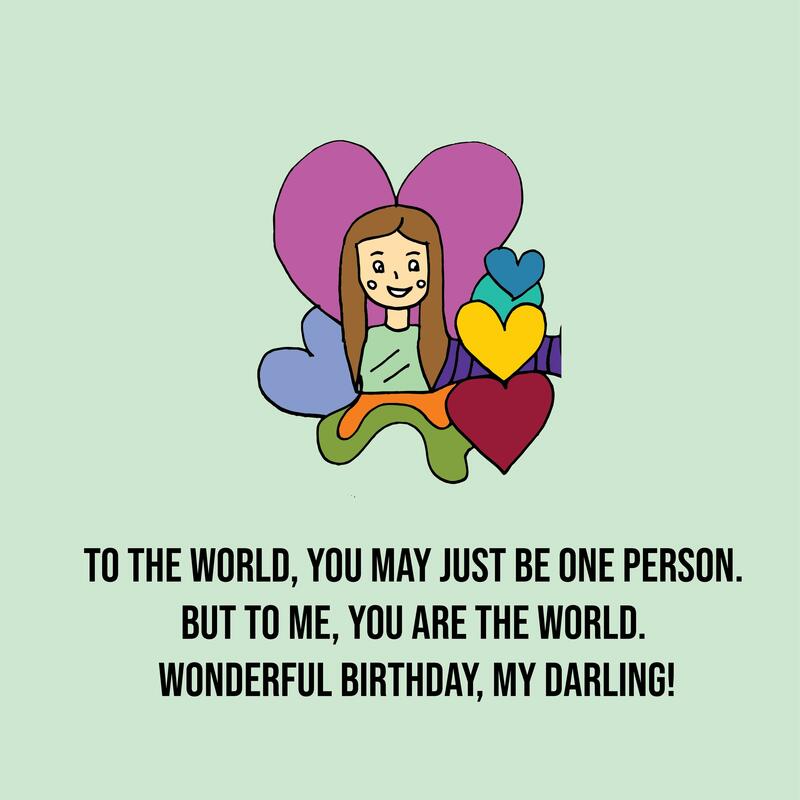 On your special day, I wanted you to know that you really mean the world to me. I am truly honored to be your partner in life. I love you so much! Happy birthday my dear, it’s too bad that everyday is not your birthday. Because honestly, I would not mind spending eternity celebrating your special day. I love you! Sometimes, all I want is just to lie down in silence and rest my head on your chest. As I listen to your heartbeat, I realize just how lucky I am that we found our way t o each other. Happy birthday, my love! Happy birthday my love! Being your partner is the easiest job in this world and I could not be thankful that I was given such an amazing opportunity. All the cakes and desserts in the world could never match how sweet you really are. Today is your birthday and I am sure you will receive tons of gifts. However, those gifts will not be enough to compare the love that you have given me – gift of true love and everlasting happiness. Happy birthday! My love, you may be older to me but you’re still that one gorgeous girl whom I adore so dearly. Happy birthday my sweetie! My love, I’m still blown away by how beautiful you become every single day. Happy birthday to you my gorgeous wife! Please know that I will always be right here to love and support you. My love, I only wish you all the love and happiness in life. Birthdays may not be forever but my love for you will definitely last until forever! Happy birthday! Happiest birthday to the most adorable, sincere, and gorgeous woman in the universe! I’m so proud to call you mine every day until forever! The thing about today is that it’s extra special. It is not just an average birthday, but it is your birthday. Therefore, I have prepared a one big grand party and an even bigger cake to revel the day you were born on Earth! Happy birthday my love! My love, I admit I have done so many crazy things in life but there’s only one thing I never regret – falling in love with you. Happy birthday, my love! Even in the midst of the coldest nights, I can truly feel the warmth of your love. Birthdays may be normal for some, but your birthday is extra special my love and that’s because I always get to be part of it. Happy birthday! Thank you for choosing me to be your partner in life. I love you so much! My love, we may not be together today to celebrate your big day, but I want you to remember that you will always remain in my heart forever. Happy birthday to you my sweetie! My love, you’re the beacon in my nights and the rose among my many thorns. Without you, I would not be the kind of man that I am today. So thank you for coming to my life, happy birthday! My darling, I would like to give you the grandest present ever. But I know that material things can never express how much I feel for you so I decided to just give directly from the bottom of my heart. Happy birthday! Happy birthday my love. I only have these three words to give you on your special day – I LOVE YOU. We might still be early in our relationship but I know that our love knows no bounds. I love you so much! My love, I might not get to say this to you too often but I truly appreciate all the great things you have done for my life. You have brought beauty to my gloomy days and warmth during the cold winter nights. So here’s wishing for a perfect weather to celebrate your birthday. Happy birthday! My love, spending special moments with you is what I imagine heaven should be. It’s filled with joy and love, wrapped in the arms of the people we love. Happy birthday! May this day bring you all the things you have ever wished to achieve! Happiest birthday to my love, the person whom I have prayed so hard in my life. May your special day be filled with all the love, joy, and happiness that you truly deserve! Happy birthday my love! On this special day, let us celebrate all your achievements in life and all the successes that are yet to come. I am truly proud for all the things that you do. I promise to always love and support you. I love you! My love, my favorite moment in life was when I was given an unexpected blessing – you! Thank you for coming into my life. You are truly the best blessing that I have received in my life, happy birthday! Tonight, as I get ready to sleep, I can think of nothing more than tomorrow and celebrating with an amazing person like you. Thank you so much for coming into my life. Happy birthday! My love, our story may just have started. But here we are celebrating life’s most precious moments together. Happy birthday to you, the love of my life! On this special day of your life, I just want you to know how much you are really loved. Thank you for all the great things that you did for me. I love you so much, happy birthday! Happy birthday my love! May this day be filled with blessings, love, joy, peace, and happiness! Thank you so much for coming into my life. I cannot imagine what my life is without you in it. Today is another day that we get to celebrate the awesome uniqueness person that’s you. Thank you for the kind of person that you are to me. You taught me how to be grateful in life even in the midst of challenges and sorrow. I love you, happy birthday! Happy birthday my love. May the smile on your face be an obstacle to every evil on Earth! Thank you for choosing me to be your partner. I promise to love you until forever. Happy birthday my love. May every second, every minute, and every hour of your life be filled with joy, love, and happiness! I love you so much, to the moon and back! I love everything about you, my sweetheart. I love it when you laugh, I love it when you talk, I love it when you walk, and I love it when you simply hold my hand! Thank you for making me feel loved every single day of my life. My love, you may just be one person for the entire world. But for me, you are my whole world. I love you so much, happy birthday! Happy birthday my love. You’re my greatest love. The kind of love that radiates and shines like the sun, and the kind of love that flies from one end to another. I love you so much! I love you so much my darling. In fact, I cannot think of any word to express how much I truly love you. 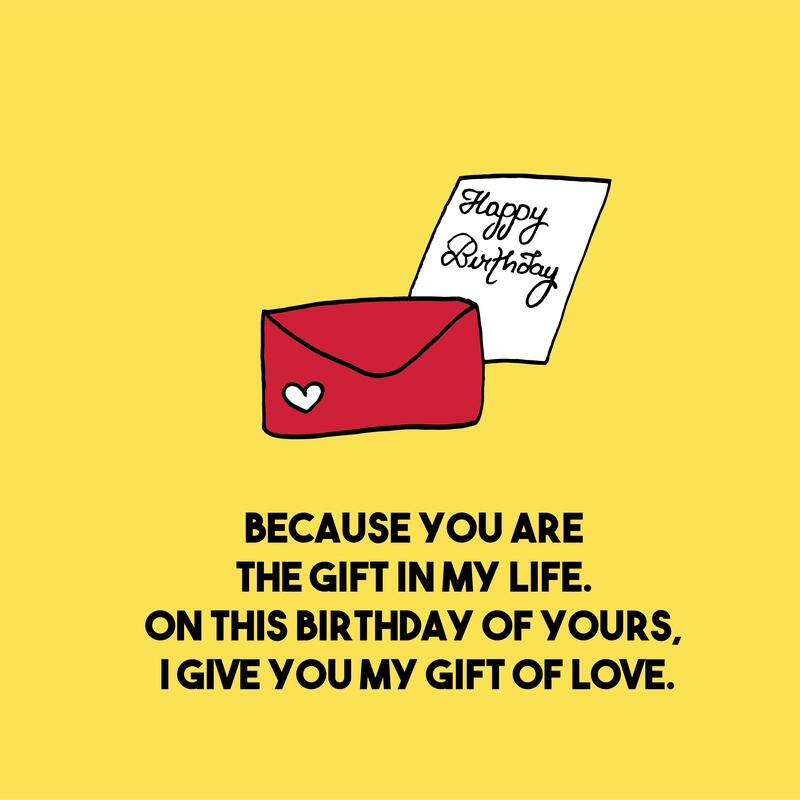 So on your birthday today, I only want to shower you with so much love, happiness, and care. Happy birthday!